Purpose: To evaluate the long-term efficacy of the 0.70 mg dexamethasone (DEX) intravitreal implant in patients with birdshot chorioretinopathy (BSCR). Methods: Retrospective descriptive case series of BSCR patients treated with DEX implant (DEX implant 0.70 mg, DEX). Patients receiving treatment between September 2013 and November 2016 with a minimum follow-up (FU) of 12 months were included. 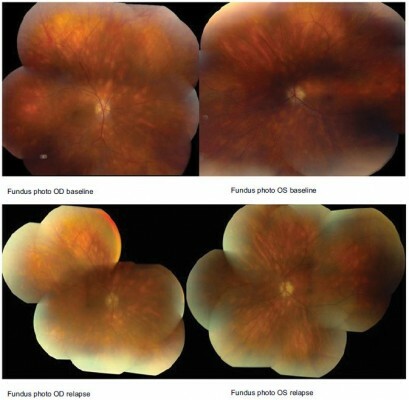 The outcomes of primary interest were vision-related functioning, Snellen visual acuity, ocular inflammation status, presence or absence of vasculitis, change in central macular thickness, and development of glaucoma and/or cataract. Change in vision-related functioning was evaluated by comparing the National Eye Institute Visual Function Questionnaire-25. The outcomes were assessed at baseline, after DEX implant, at time of relapse, and at last FU. Results: Three patients (six eyes) were included in the study and were followed for 1–3 years. They received 1–4 DEX implants OU. All patients demonstrated improvement in National Eye Institute Visual Function Questionnaire-25 scores. Mean Snellen visual acuity better than or equal to 20/40 was seen in three eyes at baseline and five eyes at last FU. At induction, all of the patients (six eyes) had active vitritis and two (four eyes) had retinal vasculitis. All three patients (six eyes) were quiet at last FU. One patient (two eyes) developed bilateral ocular hypertension requiring topical therapy and discontinuation of DEX implants. Two patients (three eyes) developed posterior subcapsular cataract during therapy. Two patients (four eyes) showed progression of disease while on DEX therapy. All patients were eventually transitioned to systemic immunosuppressive drug therapy. Conclusion: BSCR patients receiving DEX implant experienced clinically meaningful improvements in patient-reported visual function as well as ocular inflammation. However, patients in this study required repeat implantation and were unable to be maintained on DEX implant long term due to development of adverse effects or progression of disease. Eventually, it was necessary to transition to systemic immunosuppressive therapy in all patients.